Convertible securities are an opportunity for investors who want to participate in equities but are willing to exchange the maximum possible upside for protection against the downside of equities. The asset class was pioneered by Calamos Founder, Chairman and Global CIO John P. Calamos, Sr., more than 40 years ago. 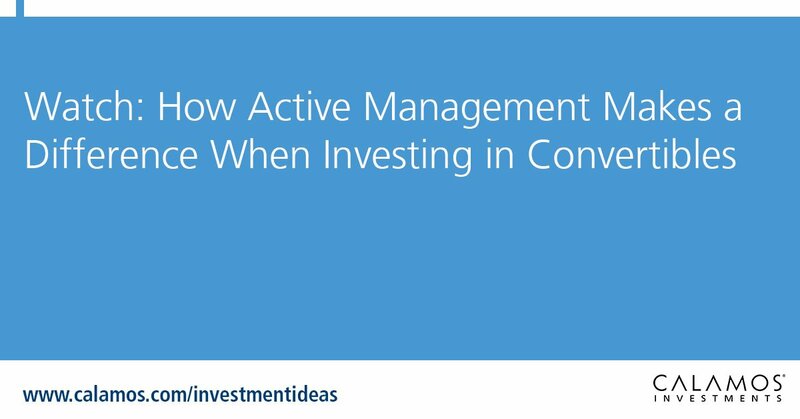 Actively managed convertible securities can be deployed strategically and tactically in an asset allocation, as Calamos Founder, Chairman and Global CIO John Calamos, Sr. and Eli Pars, Co-CIO, Head of Alternative Strategies and Co-Head of Convertible Strategies, and Senior Co-Portfolio Manager discuss in this video. The top-performing fixed income asset class? While fixed income asset classes may trade places year after year, there has been no asset class that can rival convertible bonds in terms of performance consistency. Convertible bonds have been the top performing asset class for five of the last 10 years and second to the top for two years. The interactive quilt below shows the calendar year total returns ranked from best to worst from 2008-2018. And, convertibles sit on top for 2018 as of 12/31/18. Select an asset class to turn on or off. Source: Bloomberg and Morningstar. Past performance is no guarantee of future returns. Convertible bonds are represented by the ICE BofAML All U.S. Convertibles Index (VXA0), a gauge of the performance of the U.S. convertible market. U.S. aggregate bonds are represented by the Bloomberg Barclays U.S. Aggregate Bond Index, covers the U.S.-denominated, investment grade, fixed rate, taxable bond market of SEC-registered securities. High yield bonds are represented by the Credit Suisse U.S. High Yield Index, an unmanaged index of high yield debt securities. U.S. government bonds are represented by the Bloomberg Barclays U.S. Government Index, an unmanaged index considered representative of fixed income obligations issued by the U.S. Treasury, government agencies and quasi-federal corporations. Treasury bills are represented by the Bloomberg Barclays U.S. Treasury Bill 1-3 Month Index, is a component of the Short Treasury Index and includes aged U.S. Treasury bills, notes and bonds with a remaining maturity from 1 up to (but not including) 12 months. U.S. investment grade bonds are represented by the Bloomberg Barclays U.S. Corporate Investment Grade Index, consists of publicly issued, fixed rate, nonconvertible, investment grade debt securities. Global asset-backed securities are represented by the Bloomberg Barclays Global Asset Backed Index, a fixed income index that focuses on asset-backed securities and includes pass-through, controlled-amortization and bullet-structured securities, which have a minimum average life of one year. Government bonds ex. U.S. are represented by the ICE BofAML Global Government Bond Index, excluding U.S., tracks the performance of investment grade sovereign debt publicly issued and denominated in the issuer's own domestic market and currency. Opinions and estimates offered constitute our judgment and are subject to change without notice, as are statements of financial market trends, which are based on current market conditions. We believe the information provided here is reliable, but do not warrant its accuracy or completeness. This material is not intended as an offer or solicitation for the purchase or sale of any financial instrument. The views and strategies described may not be suitable for all investors. Opinions are subject to change due to changes in the market, economic conditions or changes in the legal and/or regulatory environment and may not necessarily come to pass. This information is provided for informational purposes only and should not be considered tax, legal, or investment advice. References to specific securities, asset classes and financial markets are for illustrative purposes only and are not intended to be, and should not be interpreted as, recommendations. Important Risk Information. An investment in the Fund(s) is subject to risks, and you could lose money on your investment in the Fund(s). There can be no assurance that the Fund(s) will achieve its investment objective. Your investment in the Fund(s) is not a deposit in a bank and is not insured or guaranteed by the Federal Deposit Insurance Corporation (FDIC) or any other government agency. The risks associated with an investment in the Fund(s) can increase during times of significant market volatility. The Fund(s) also has specific principal risks, which are described below. More detailed information regarding these risks can be found in the Fund’s prospectus. The principal risks of investing in the Calamos Convertible Fund include: convertible securities risk consisting of the potential for a decline in value during periods of rising interest rates and the risk of the borrower to miss payments, synthetic convertible instruments risk consisting of fluctuations inconsistent with a convertible security and the risk of components expiring worthless, foreign securities risk, equity securities risk, interest rate risk, credit risk, high yield risk, portfolio selection risk and liquidity risk. The principal risks of investing in the Calamos Growth and Income Fund include: convertible securities risk consisting of the potential for a decline in value during periods of rising interest rates and the risk of the borrower to miss payments, synthetic convertible instruments risk consisting of fluctuations inconsistent with a convertible security and the risk of components expiring worthless, equity securities risk, growth stock risk, small and midsized company risk, interest rate risk, credit risk, liquidity risk, high yield risk, forward foreign currency contract risk and portfolio selection risk. The principal risks of investing in the Calamos Global Convertible Fund include: equity securities risk consisting of market prices declining in general, growth stock risk consisting of potential increased volatility due to securities trading at higher multiples, foreign securities risk, emerging markets risk, currency risk, geographic concentration risk, American depository receipts, mid-size company risk, small company risk, portfolio turnover risk and portfolio selection risk. The principal risks of investing in the Calamos Global Growth and Income Fund include: convertible securities risk consisting of the potential for a decline in value during periods of rising interest rates and the risk of the borrower to miss payments, synthetic convertible instruments risk consisting of fluctuations inconsistent with a convertible security and the risk of components expiring worthless, foreign securities risk, emerging markets risk, equity securities risk, growth stock risk, interest rate risk, credit risk, high yield risk, forward foreign currency contract risk, portfolio selection risk, and liquidity risk. The principal risks of investing in Calamos Evolving World Growth Fund include: equity securities risk consisting of market prices declining in general, growth stock risk consisting of potential increased volatility due to securities trading at higher multiples, foreign securities risk, emerging markets risk, convertible securities risk consisting of the potential for a decline in value during periods of rising interest rates and the risk of the borrower to miss payments, and portfolio selection risk. ©2018 Calamos Investments LLC. All Rights Reserved. Calamos®, Calamos Investments®; and Investment strategies for your serious money® are registered trademarks of Calamos Investments LLC.